As you might expect, the reverse is true for the underdog. The underdog team is given a positive number because points are added to the underdog team's final score to determine if the underdog is a winner for purposes of the sports bet. Events that tie are considered "no action" - no one wins or loses. Let's look at an example: The New England Patriots are playing the New York Jets. The Patriots are expected to win the game and the spread is 6. So, you see the Patriots listed as -6 and the Jets listed as +6. You place a bet on the Patriots. If the Patriots win by more than 6 points, you win the bet. If the Patriots only win by 6 points, then the game is considered "no action" and all money is returned. If the Patriots win by less than 6 points, you lose the bet. Point Spread with Odds (i.e., golf matchups): A combination of the two above. The selection must win by the point spread, and the payoffs are calculated by the odds. - Teaser wager payoffs depend on how many teams are selected and how many points are given to each team. Payoffs for football and basketball teasers are shown in the tables below. If there is a push in one or more of your individual parts, then the wager steps down to the next lower number of teams. If a two-team teaser has a push and a winner, then the teaser is "no-action" (refunded). Customers may still have "Monster Teasers" applied to their account setup. Please be aware that Ties Lose on all "Monster Teasers". - A teaser is a group of straight bets or totals combined into one bet. The difference between a parlay and a teaser is that with a teaser, the line you bet against for each individual wager is moved to your favor by the number of points of the teaser. If the regular line is -10 and you have a 6-point teaser, then your line would be -4. As with a parlay, all of the individual parts need to win for the teaser to be a winner. Teasers are not yet available for baseball or hockey. - Progressive Teaser works much the same way as a teaser. However, with a Progressive Teaser, there is a consolation payout for having an incorrect selection. Once having the minimum amount of correct selections for a payout, each additional correct selection increases the payout odds. Ties are considered incorrect selections on Progressive Teasers. Only one side or total may be selected on a game. Progressive Teaser selections with a "side to a side", "side to a total", or "total to a total" within the same game are not permitted. Progressive Teasers are available on the internet only. This option is not available for phone wagering. - A Multichance Teaser works much the same way as a Progressive Teaser. However, the payouts do not increase with more correct selections. Once the minimum amount of correct selections has been won, the MultiChance play will be a winner. Winnings from a MultiChance plays are not credited to an account until all selections made have a result. MultiChance plays will not be credited before all selections have concluded (even if the wager is already a winner). When selections have not concluded, you must make use of RIF (rolling-if-bet) wagering options in order to use winnings or potential winnings from this wagering option. 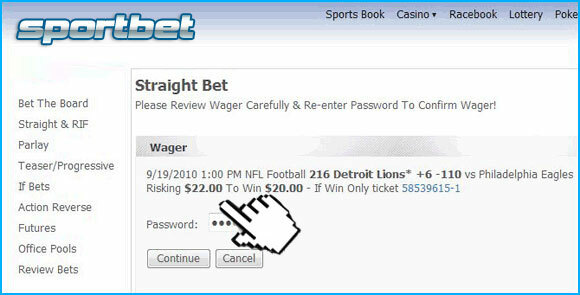 Once logged into the Sportsbook, select Parlay from the sportsbook-wagering menu. Make your Parlay selections.